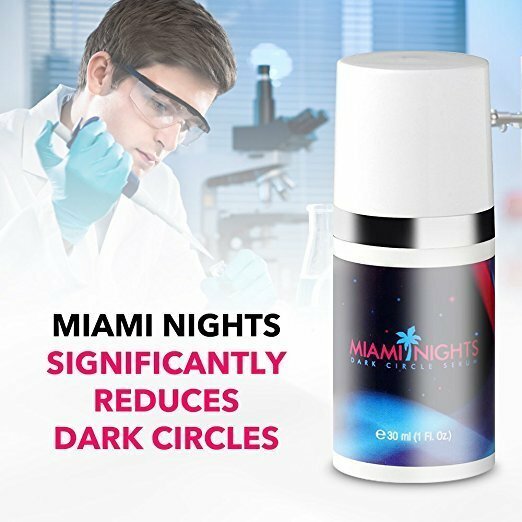 Containing a proprietary combination of peptides and superfood antioxidants, the Miami Nights Dark Circle Eye Cream will help your skin look younger in no time. Intended to improve skin firmness and elasticity, this cream promotes lymphatic drainage and toning to safely reduce puffiness and bags around the eyes for a brighter, more youthful appearance. 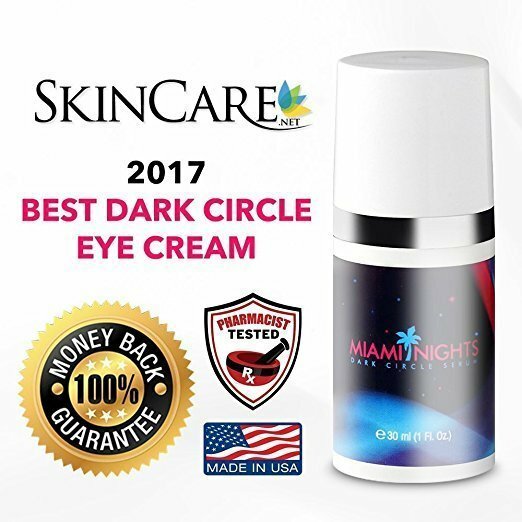 By stimulating the skin around the eyes in a way that counters the pigmentation caused by lack of sleep and exposure to toxins in the environment, the tone and texture around the eye area is drastically improved with daily use of this cream. 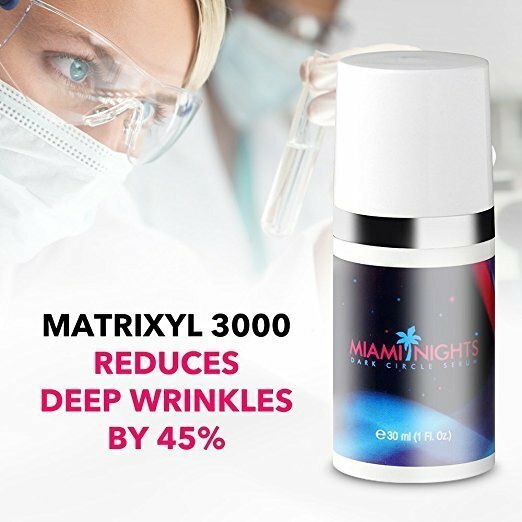 With this special blend of peptides and antioxidants, designed by our team of cosmetic pharmacists, nutrients are pumped into the affected area, leaving the skin under and around the eyes brightened and evenly toned. 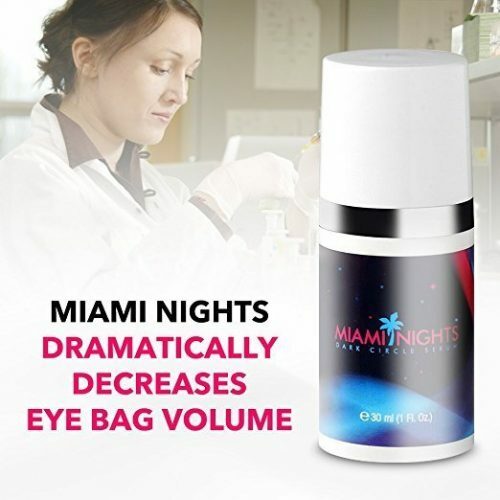 The secret to this formula are the powerful active ingredients. 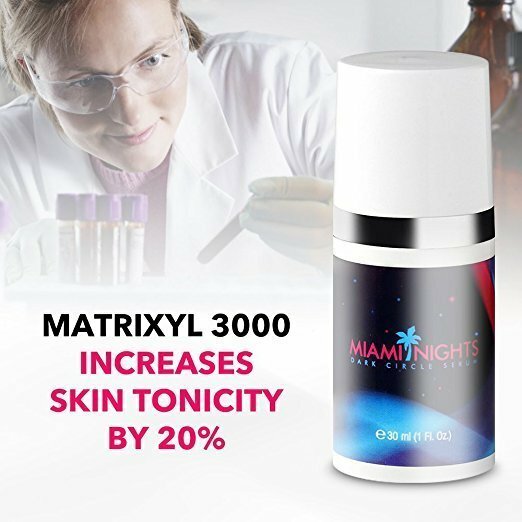 Matrixyl 3000 is added to repair skin and boost skin rejuvenation. 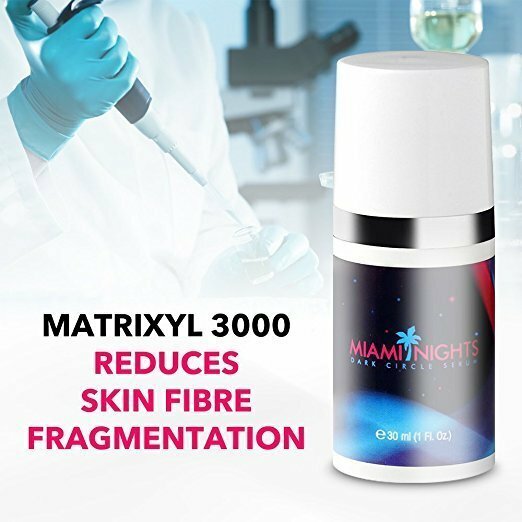 Palmitoyl Tripeptide-1 is included to increase collagen production, an essential driver in keeping the skin cells more supple and robust, as well as minimizing skin pigmentation. For a gentle finish, aloe vera is added for its moisturizing properties to keep the skin hydrated and fresh. Apply a very small amount to finger and gently tap into affected area surrounding the orbital bone. Water, Cyclopentasiloxane, Dimethicone Crosspolymer, Propanediol, Polyglyceryl-4 Isostearate, Cetyl PEG/PPG-10/1 Dimethicone, Hexyl Laurate, Caprylic/Capric Triglyceride, Spilanthes Acmella Flower Extract, Alcohol, Acmella Oleracea Extract, Phenoxyethanol, Ethylhexylglycerin, Carnitine, Ruscus Aculeatus Root Extract, Citric Acid, Potassium Sorbate, Sodium Benzoate, Glycerin, Steareth-20, N-Hydroxysuccinimide, Chrysin, Palmitoyl Tripeptide-1, Palmitoyl Tetrapeptide-7, Hesperidin Methyl Chalcone, Dipeptide-2, Butylene Glycol, Chenopodium Quinoa Seed Extract, Helianthus Annuus (Sunflower) Seed Oil, Arnica Montana Flower Extract, Albizia Julibrissin Bark Extract, Darutoside, Caffeine, Caprylyl Glycol, Cameila Sinensis (Green Tea) Leaf Extract, Aloe Barbadensis Leaf Juice, Coffea Arabica (Coffee) Leaf/Seed Extract, Morinda Citrifolia (Noni) Fruit Extract, Garcinia Mangostana (Mangosteen) Fruit Extract, Euterpe Oleracea (Acai) Fruit Extract, Lycium Chinese (Goji Berry) Fruit Extract, Punica Granatum (Pomegranate) Fruit Extract, Myrciaria Dubia (Camu Camu) Fruit Extract, Carya Ovata Bark Extract, Phytonadione.